Apr 5, 2019 | What Am I Reading? 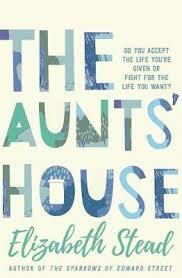 The Aunts’ House (UQP 2019) by Elizabeth Stead is a curious, quirky, strange and wonderful story set in Sydney in 1942 and featuring the feisty and clever eleven-year-old Angel Martin, recently orphaned and sent to live in a boarding house full of eccentric characters and headed by the mean (in both senses of the word) landlady Missus Potts. Angel has a pair of aunts that live in a house by the sea, but the two elderly women disown her and refuse to allow her inside the gates of their aging home, and so the young girl embarks on a quest to persuade her aunts to love her, beguiling the boarding house guests and others she meets along the way. She often skips school (especially after the incident of the wandering hands of the headmaster) and prefers to ride the trams, wander the art gallery, or play where she most feels at home – in the green space of the bush gully or beside the ocean she has named Mariana. She feels she learns more from her experiences and her adventures than she could possibly learn from school – she reads books, she listens to music, she sits cross-legged for hours to appreciate a single painting. She befriends the numerically gifted Barnaby Grange, who spends his days calculating maths equations and rarely speaks in words, and the flamboyant Winifred Varnham, who dresses in exotic fashions and opens Angel’s eyes to a whole new world view. Angel is one of those characters in literature that will stay with you. She is wild and untamed – her hair a tangled mess, her feet bare, tough and dirty, her one dress threadbare and worn, her arms and legs scratched and pricked by brambles. Although this story is not told in the first person, we nevertheless see it very much from Angel’s perspective; we are inside her head which is crowded with music and colours, we are privy to her private thoughts about those she loves and those she despises, and about the people whose love she is determined to win. We experience her many sorrows (the death of her mother, the disregard and humiliation at the hands of others) and her small triumphs (the friendships she cultivates, the kindnesses of others, the joy of riding the Sunday trams, the satisfaction of besting a foe). And we delight in her sharp and cutting wit and her cheeky sense of humour. The place and time of wartime Sydney is evocative of the deprivation and restrictions of the era. Stead produces phrases and sentences that are wistful, playful, poignant, telling and sometimes abstract or strange, frequently offering a truthful or honest take on the world that is deceptively simple but flinty and wounding. There is much talk of madness in this book – Angel’s mother died in the sanitarium – and people are always telling Angel she is ‘not right in the head’. But it is this wonderful otherness, this almost magical way of thinking, that is so seductive and engaging. Angel is a girl with a troubled past and a difficult present, but she is so alive, so compelling, so fascinated by life and all it potentially has to offer, that she is eager to rush headlong into her future, resolutely indomitable in her passion to fight for what she wants rather than merely accept her lot in life. And along the way, this book explores what it means to be part of a family, and how we might build a family from those we choose rather than merely from those to whom we are related.